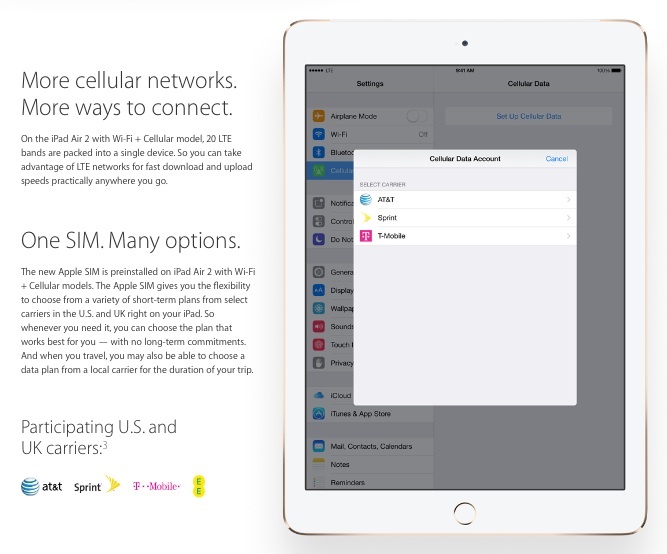 The Apple SIM gives you the flexibility to choose from a variety of short-term plans from select carriers in the U.S. and UK right on your iPad. So whenever you need it, you can choose the plan that works best for you—with no long-term commitments. And when you travel, you may also be able to choose a data plan from a local carrier for the duration of your trip. So far, Apple lists three of the top four US operators—AT&T, Sprint, and T-Mobile—as partners. In the UK, there’s EE, a joint venture between T-Mobile and Orange. Apple says participating carriers may change. A more compelling, user-friendly scenario might see your phone number and crucial services—messaging, voicemail, etc.—tied to your Apple SIM, and a vibrant marketplace where carriers compete for your business. This is already sort of what Apple is about to offer for the iPad. Imagine booting up your iPhone for the first time and seeing four competing offers for your business from different operators—with short or no contract duration. Or an even deeper integration where Apple bills you as a virtual operator and constantly shops for the cheapest connection—perfect for those who travel overseas frequently. These are actually some of the same scenarios I imagined Google might have tried five years ago when it first launched its Nexus phones. But Google has actually done very little to disrupt the mobile industry. Apple just might.